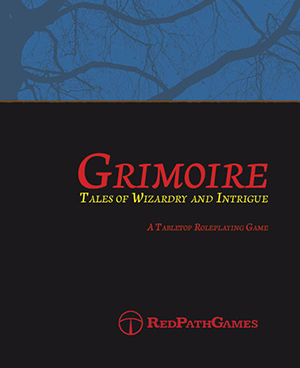 Grimoire offers players a unique roleplaying experience situated firmly beneath the pointy hat of a wand-waving maniac. Where other roleplaying games may attempt to balance magic in some way—perhaps to allow bold heroes to fight beside them on equal footing—Grimoire makes no such efforts. Every Player Character is a Wizard with access to a nearly unlimited supply of magical power and a near-total disregard for the consequences of using it inappropriately. Wizards believe that magic fixes everything… eventually. Grimoire – Tales of Wizardry and Intrigue is available in Hardcover, Paperback and PDF. Grimoire is built upon a unique and super-flexible spell system that allows players to build their spells on the fly with real magical phrases. Whether you prefer the typical high fantasy setting, a wizarding academy, or modern urban magic, Grimoire has a scenario for you. Grimoire – Tales of Wizardry and Intrigue features a variety of tables for randomisation and inspiration. Anything from randomly generating your Wizard to your Adventures is possible from the tables contained within these pages. Quests, rumours, magical artifacts and high-fashion outfits are all included, and the possibilities… are entirely absurd. Wands are an important tool in spellcasting! Get everyone in on the fun of waving a length of wood around while incanting mystical phrases. Make sure your players know every Wizard’s names and what their job is with eye-pleasing paper badges they can decorate and tape to their shirts. Gone are the days of being treated like some common fool! That’s right, these Non-Player Characters understand there’s nothing common about a Wizard. Non-Player Characters are not usually equipped to deal with Wizards, and will treat them with the appropriate amount of wariness normally afforded an easily-triggered rottweiler.